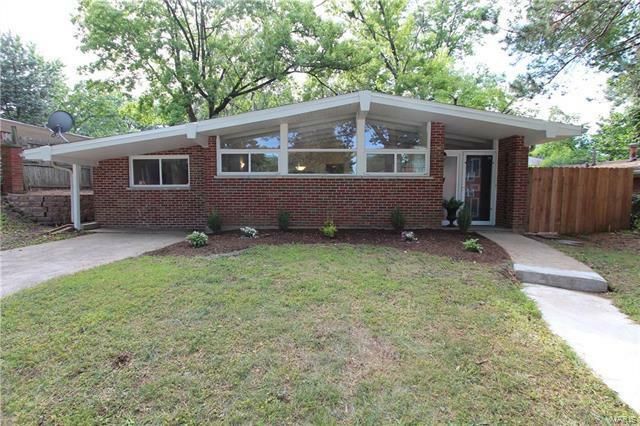 Welcome to this beautifully renovated Mid-Century Modern Ranch. You'll discover a fabulous open floor plan w/ vaulted ceilings, large sunny windows & wood-plank vinyl floors. The foyer, living rm & dining rm flow w/ the redesigned kitchen, which includes new cabinets,stainless steel appliances, expansive granite counter tops & peninsula-perfect for entertaining! An adjoining family room w/ sky lights, utility room & storage offer even more space & convenience. Both bathrooms are freshly updated w/ porcelain tile, vanities & trim. All 3 Bedrooms feature new plush carpet, large closets & plenty of space. Outside, there is a private fenced in patio area, level backyard & large tool shed. With all new tankless water heater, thermal windows, central air conditioning, flooring, paint & more, this house is completely move-in ready! Located on a nice quiet street near Mona walking trail & minutes away from all the vibrancy that U City/Clayton has to offer. Come see it today before it is gone! 40/64 to North on 170 to Rt (East) on Delmar to Left (North) on North and South Rd to Left on Peach Tree to Right on Warder.